Chuck Berry's show in Semblancay on July 4th 2003 has been cancelled!! There are further dates in the works for Chuck Berry's European Tour 2003. 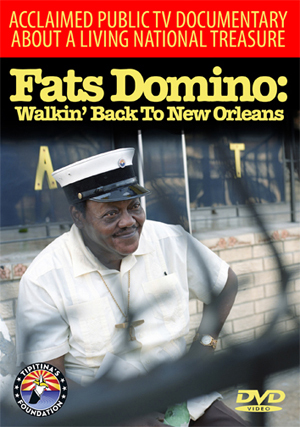 Fats Domino plays only a handful of shows these days. Most of them in his hometown, New Orleans, LA. at the Jazz & Heritage Festival in New Orleans. his seventies at the time of this show. But there are a whole lot of hits--"I'm Walkin',"
songs marked with an asterisk. mixing and mastering is done. he has performed around the world for nearly 50 years. that have influenced virtually every rock musician since the 1960's. of them early rock 'n' roll classics. barriers, not only with his electric guitar but also with wordplay and imagery. tastes in music, along with teenage romance. one of the owners, told him he didn't like the title. cosmetics box on a window sill beside a secretary's desk. by a black artist to outsell its white cover versions. after hundreds of thousands of dollars had been divided three ways. the 1950's and 60's because he owned a nightclub with an interracial clientele. saw him driving or dancing with white women. Mr. Berry left federal prison, he was, by some accounts, a different man. rooms, sit and swap licks and jokes. In England he was cold, real distant and bitter. demanding requirements on the road, have often exasperated his admirers. of an affront than a tribute. loudly and once punched him backstage after he tapped him on the shoulder. and promptly punched him in the nose. you mean by like,'' Mr. Berry replied coolly. Mick Jagger, Bruce Springsteen and Eric Clapton. in the best of the three colored sections of St. Louis,'' he recalled later. worked in a flour mill and later as a repairman in apartment buildings. trumpet, and a daughter sang with Marian Anderson. Harry James and Nat King Cole. accompaniment of another student, Tommy Stevens, who had played at nightclubs. singing became an amendment to my religion,'' he said. neighbors. He began working at parties. the first wild and disruptive incidents in his life. had never been convicted of a felony, unhesitatingly gave him the maximum sentence. sexually charged relationship with the assistant superintendent's wife. He was released at 21.
shells. Then he trained as a beautician, following two of his sisters. introduced them, and Mr. Berry asked Mr. Waters whom to see about making a record. artists in the early days of rock 'n' roll, Mr. Chess asked Mr. Berry for a tape. the country's most popular artists. white teenage culture, black R & B and country and western music. There were limits to a black performer's success in Mr. Berry's golden era. career. He used his term to complete his high school education and write songs. when the doors opened again, walked out without saying a word,'' he said. before 35,000 students in Coventry, England. said Mr. Berry had twice burst into tears. Gramercy Park Hotel in New York, where a woman said he had beaten her up. Eventually Mr. Berry pleaded guilty to harassment, and was fined $250. to profit from his wealth. and only cash -- before each performance. he generally walks away. Met by a club representative at an airport, Mr.
with rage that the agent wasn't already waiting for him. demands a fine of $2,000 paid before the show. where they were supposed to film. It was Mr. Berry asking for the film's producer. How Mr. Berry knew the phone number is unclear, but his message was direct. was a tribute to him. But the payment was made and rehearsals began. if someone understands Mr. Berry's rules, he is actually easy to get along with. ''He sets the guidelines and lives by them,'' he said. waiting to go on at exactly 8, not later, not earlier. British and French tourists, Mr. Berry can seem depleted, drenched in sweat. their vows before their four children and their grandchildren and great-grandchildren. Mr. Berry has not made a record in 22 years, but says he is working on one now. Bob Dylan and Bruce Springsteen. (1964); and the movie soundtrack ''Hail! Hail! Rock n Roll'' (1987).